By late February or March, Elf Owls depart Mexico to breed in the US. These miniscule owls weigh less than an ounce and a half — a bit less than a golf ball. During the breeding season, Elf Owls live in woodlands and desert cactus habitats from southwest Texas into southern Arizona. And they’re determined predators. At dusk, Elf Owls hunt beetles, crickets, and spiders, plus the odd lizard or mouse. Larger prey such as scorpions — with the stingers carefully removed — may end up cached in the nest for later dining. As twilight deepens along a dry West Texas streambed, a tiny owl peers out from a hole in a sycamore tree. It’s an Elf Owl, the smallest species of owl in the world. Standing less than six inches tall, feathered in gray with big yellow eyes, the Elf Owl weighs less than an ounce and a half — a bit less than a golf ball. And it’s a determined predator. Flying out from its tree cavity at dusk, the Elf Owl hunts beetles, crickets, and spiders, plus the odd lizard or mouse. Larger prey such as scorpions — with the stingers carefully removed — may end up cached in the nest for later dining. Elf Owls live in woodlands and desert cactus habitats in southwest Texas and southern Arizona [Editor's note: New Mexico, too!]. 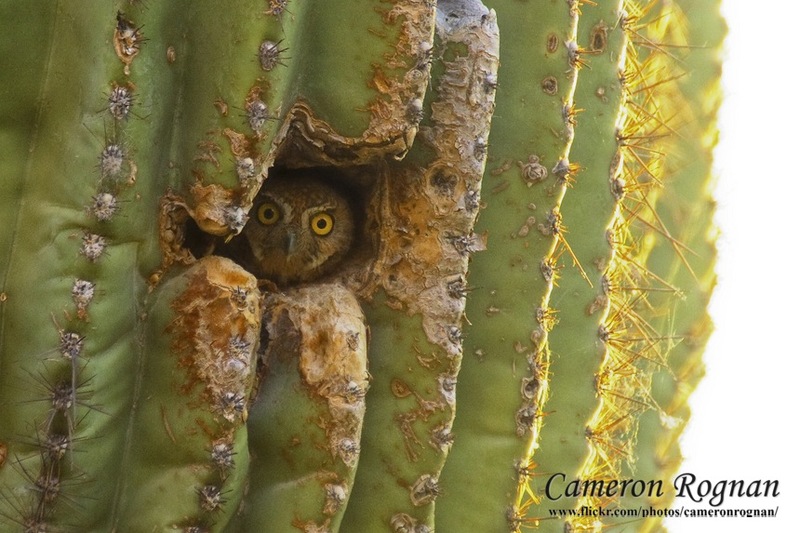 In desert habitats, they often nest in woodpecker holes in tall saguaro cactus. They depart the US by October for warmer latitudes of Mexico, where insects are more available in winter. But spring comes early to the American Southwest, and the minuscule owls return by late February or March, ready to begin their breeding season. Travel to Big Bend with BirdNote in August 2017, and you might get to see an Elf Owl. Learn more at BirdNote.org. I’m Michael Stein. Bird sounds provided by The Macaulay Library of Natural Sounds at the Cornell Lab of Ornithology, Ithaca, New York. 105533 recorded by Geoffrey A. Keller, 188270 recorded by Bob McGuire.